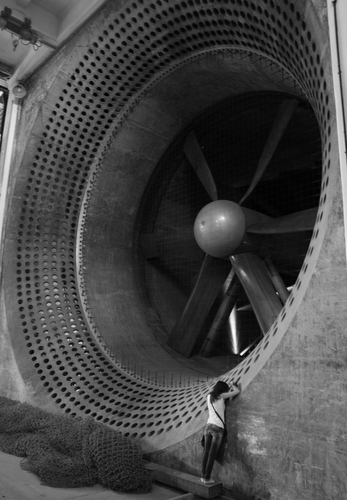 Foto Friday CV – ..:: NJ Brideau ::..
A couple of weeks ago I read an article about a historical wind tunnel in the UK that was open to the public for the first time as part of an art exhibition. Luckily for me this building is located at the RAF base in Farnborough, which is about 80 minutes away by train. Regular readers will know that I have an interest in large structures, especially those that are abandoned or derilect, so naturally I was keen to check this out. Mafalda also spotted the opportunity for photography – that is her pictured above to give you an idea of scale (she is 5’5″ or 165cm). We had a great time, and I’ll try to do a quick write up with some other favorite pictures soon. 1/8s f/3.5 18.0mm ISO 400. Black and white filter. Au revoir until next week.